The short-term results of Hurricane Irma’s swath through Florida and into the Southeast are estimated at economic losses of $52 billion, including tourism losses, crop damage, and infrastructure impacts. This is slightly higher than the inflation-adjusted cost of Hurricane Andrew, which sliced across Southern Florida in 1992, and about half the cost of this year’s Hurricane Harvey in Texas and Louisiana. 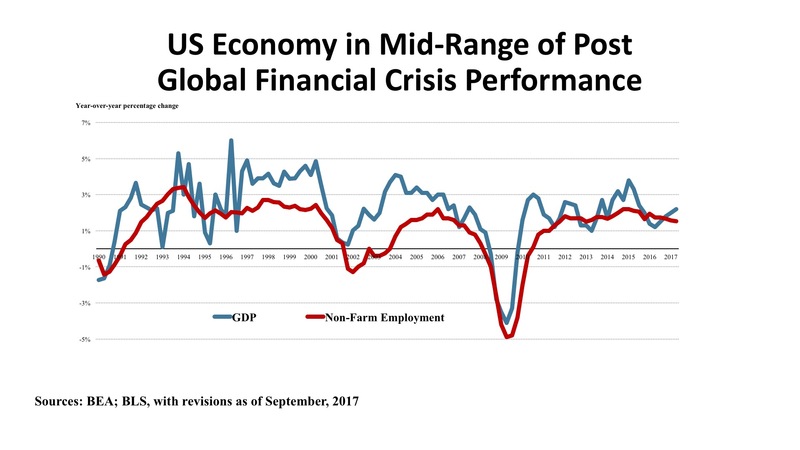 The Fed, while noting the serious hardships brought by the storm, considers the infusion of capital during the rebuilding period sufficient that the longer-term outlook in the affected areas will continue to see population and economic growth consistent with pre-storm trends. Several themes have been recurring up and down the Atlantic Seaboard. Employers are reporting strong demand for labor, but insufficient supply of workers. This is not just a “high-skill” phenomenon. While shortages in technology (especially cybersecurity) and white-collar professions such as accountants are occurring, the same is also true for blue-collar workers like mechanics, truck drivers, and construction workers. Especially in the Carolinas and in Georgia, tighter immigration is creating a drag on the supply of labor, according to local economic reports. Housing markets from New England to Florida also sound similar notes: insufficient supply, especially in homes and apartments oriented to middle-income and lower-income households. Some spot surpluses of luxury inventory – both rentals and condos – have emerged in several places from Boston to Washington, DC. Expensive housing in center cities is starting to stimulate less-costly suburban residential markets. Real estate ultimately depends upon economic productivity for sustained value. 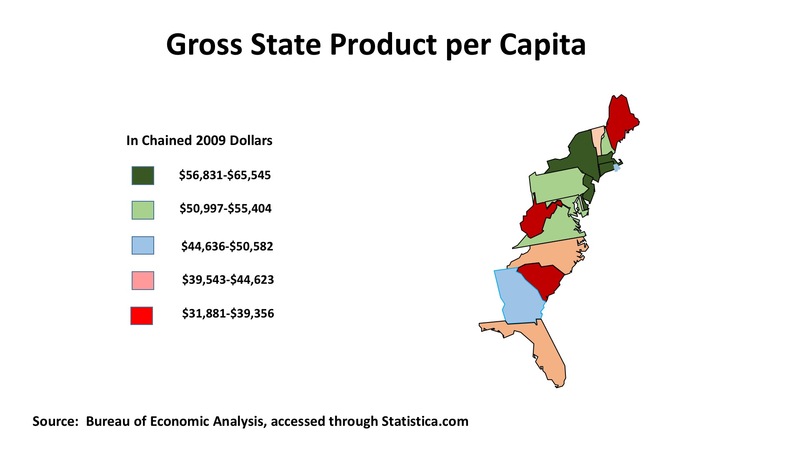 The accompanying map showing State GDP per capita illustrates the economic underpinnings of property value in the states running from Virginia northward to Vermont, especially for cities in the Boston-Washington corridor. By contrast, the southeast is “economical” in its costs but this reflects GDP per capita that is below the U.S. average (as of 2016) of $50,577. Importantly, the Northeast’s economy is based on multi-industry productivity and high-density populations, rather than the resource-based states of Alaska, North Dakota, and Wyoming (sparsely populated and dependent upon just one or two economic drivers). 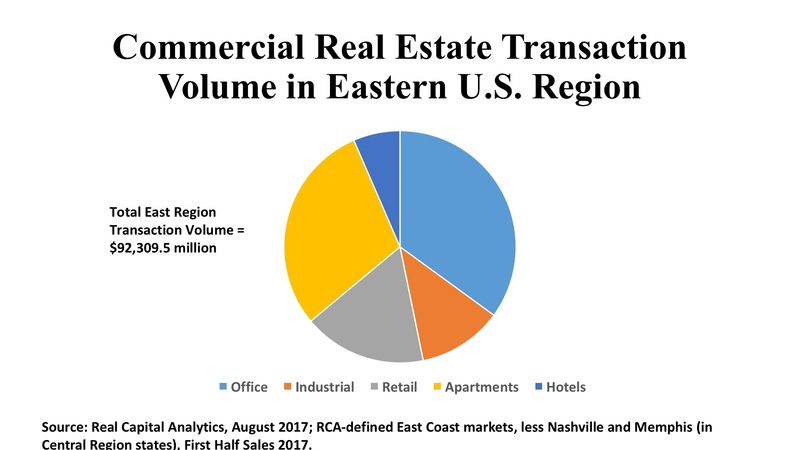 Over the first half of 2017, the Eastern region has accounted for $92.3 billion in commercial property transactions or 42 percent of the nation’s aggregate $219.9 billion volume. Investor selection varies according to locations up and down the Atlantic Seaboard. Office and retail acquisitions favor the New York, Washington DC, and Boston metros. Southeast metros like Atlanta, Charlotte, and Orlando punch above their weight in apartments, industrials, and hotels. International investors, similarly, favor the Northeast and Mid-Atlantic states, while private investors dominate transactions in the Southeast. Office. Price and cap rate levels are shifting relative investor interest toward suburban assets in many East Coast metros, although Manhattan remains the nation’s most significant office market for deals, with $7.7 billion transacting in 47 First Half purchases at an average cap rate of 4.4 percent. Boston was also strong, with $6.1 billion in office sales with averages of a 5.2 percent cap rate and price per square foot of $519. Suburban Washington saw $2.3 billion in early 2017 office deals, equaling the volume of the CBD but with an average suburban cap rate of 6.0 percent versus 5.6 percent in the District itself. The more suburban metros of the Southeast were led by Charlotte and Atlanta, both of which saw deal volume exceeding $1.5 billion. Charlotte posted a 6.3 percent average cap rate and price of $209 per square foot, which Atlanta’s averages were 6.8 percent and $165 per square foot. In all, the East captured 47.3 percent of all U.S. office acquisition volume during the first six months of 2017. Industrial. By contrast, it was the Southeast that led the Atlantic states in industrial property activity through the First Half of 2017. The activity was well distributed, with Atlanta seeing 120 individual industrial transactions, representing an aggregate $1.1 billion in sales price, at $54 per square foot. Charlotte and Miami/Dade each had more than fifty industrial deals apiece, tallying about a half-billion dollars for each. However, the so-called “tertiary markets” in this area were even more active, with $1.1 billion generated by 145 separate purchases, at the comparatively low price of $38 per square foot and high cap rate of 7.2 percent. The Northern New Jersey market, one of the nation’s largest, ranked highest in First Half investment volume, at $1.3 billion, with a solid 6.0 percent cap rate. New York’s “outer boroughs” continue to see industrials being purchased for adaptive reuse, both conversion to housing or office, or reconfiguration as “last-mile” distribution points for e-commerce. The $10.9 billion in industrial sales in the East was a 35.1 percent share of all U.S. transaction volume for this property type. Retail. The Southeast also posted a whopping $8.6 billion in retail property sales, helping the Atlantic region to $15.8 billion in total stores volume, leading the nation with a 45.8 percent share for this sector. Deal volume was elevated by REIT activity, especially the Florida-based Regency Centers acquisition. REITs had more than a 40 percent share of retail property purchases in Broward, Miami, Jacksonville, Orlando, and Palm Beach. 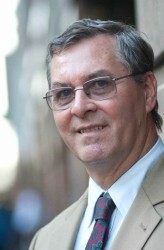 The same was true in Washington’s Maryland suburbs and Westchester County north of New York City. Despite noticeably rising store vacancies, Manhattan still attracted $1.2 billion in shopping property deals, obviously oriented to luxury at a price per square foot of $1,814, roughly ten times the national average.